We often feel frustrated when our intended personal goals and dreams are not met. 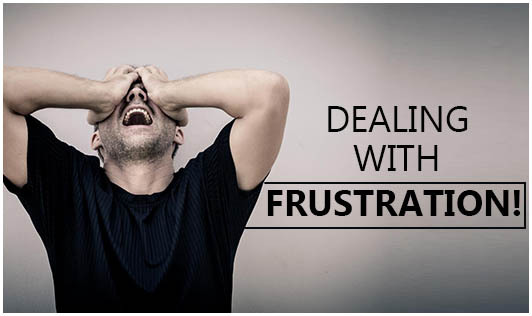 There are many things that can make one feel frustrated and it differs for each person. The cause of our frustration is often attributed to the external forces that we don't have control over. This feeling can block us from feeling motivated, we can either react by trying to solve what is causing the frustration or we can simply just give up! People respond to frustration differently, some may tackle the frustration while others may display violent behaviour. • Accept reality and avoid dwelling over what cannot be controlled. Reality can be bitter, but rejecting reality will not lower your frustration, instead it will make it stronger! • Talk to somebody you trust and don't let this frustration grow inside yourself until you explode. • Shift your focus by engaging in small but demanding activities. • Be around positive feel and count your blessings! • Write down your feelings. • Try to be positive and don't let one incident bring you down. Say to yourself "This too shall pass, as it always does." • Stop blaming yourself, it is past and you're in the present now. Blaming yourself will only put your weight on that past and pull you down. The solution is to figure out what your options are, decide on a plan, focus and then take action!